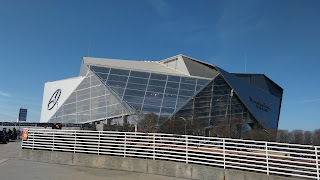 This past Saturday, the Honda Battle of the Bands, which had called Atlanta's Georgia Dome home since its inception in 2003, took place for the first time in Mercedes Benz Stadium, the new home of the Atlanta Falcons and most events that previously called the Georgia Dome home. It won't return next year. To be clear, there is no "scheduling conflict," at least not with the Super Bowl itself. Honda has always taken place during the weekend between conference championships and the Super Bowl, a weekend that has also been occupied by the Pro Bowl since 2010. Frankly, the NFL would do well to incorporate the Honda the "championship halftime" and to kick off Super Bowl week. But if The Shield, the city of Atlanta, or whoever else has determined it's a conflict, I suppose there's nothing to debate there. So where to next? There are two logical choices, and I'll snowball a third longshot. Honda's late January timing makes an indoor stadium the ideal choice in pretty much the entire continental US except for Florida. Both the Mercedes Benz Superdome in New Orleans and NRG Stadium in Houston fit that bill, are used to hosting HBCU events, and fall within the HBCU footprint. That footprint distinction is an interesting one: Should it land in either of those spots, it would make the move from MEAC (and SIAC) country onto the SWAC's turf. Certainly the SWAC bands that always have to take the hike would be pleased. Could a successful Honda in New Orleans or Houston - and with relatively little effort, a sellout is likely - have Honda questioning its allegiance to ATL, and lead to a rotation of HBCU marching's largest stage? The third option - and full disclosure, I live in North Carolina - would be Charlotte. Bank of America Stadium is open air and farther north than Atlanta, making it a bit of a tougher sell. But the Queen City seems positioned as the next city up on the south Atlantic coast, and takes many of its cues from Atlanta: Hosting QC Battle of the Bands to Atlanta's Honda; the Belk Kickoff to Atlanta's Chick-Fil-A Kickoff. Both host college football conference championships. This past summer, when DCI's Southeastern Classic was moved and downsized in the Atlanta stadium interregnum, it was North Carolina (Winston-Salem, granted) who saw the biggest boon in the supersized NightBEAT show. Charlotte is just about as accessible by air and road as Atlanta. So while an outdoor venue is unlikely to be considered, Charlotte would be a strong choice.